Victorian operating theatres were known as ‘gateways of death’ since half of those who underwent surgery didn’t survive the experience. This was an era when a broken leg could lead to amputation, when surgeons often lacked university degrees, and were still known to ransack cemeteries to find cadavers. While the discovery of anaesthesia somewhat lessened the misery for patients, ironically it led to more deaths, as surgeons took greater risks. In squalid, overcrowded hospitals, doctors remained baffled by the persistent infections that kept mortality rates stubbornly high. At a time when surgery couldn’t have been more dangerous, an unlikely figure stepped forward: Joseph Lister, a young, melancholy Quaker surgeon. By making the audacious claim that germs were the source of all infection – and could be treated with antiseptics – he changed the history of medicine forever. With a novelist’s eye for detail, Fitzharris brilliantly conjures up the grisly world of Victorian surgery, revealing how one of Britain’s greatest medical minds finally brought centuries of savagery, sawing and gangrene to an end. 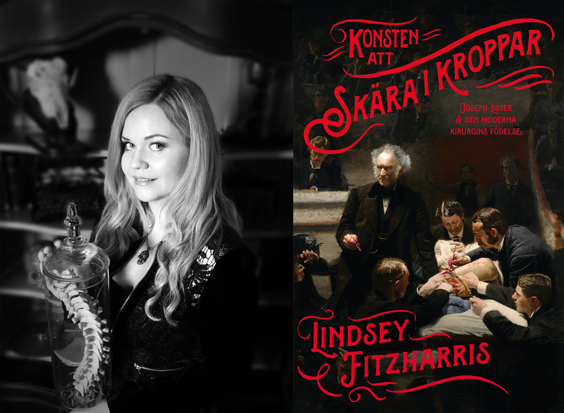 Dr. Lindsey Fitzharris is a bestselling author, and medical historian with a doctorate from the University of Oxford. Her debut book, The Butchering Art, won the PEN/E.O. Wilson Award for Literary Science in the United States; and was shortlisted for both the Wellcome Book Prize and the Wolfson History Prize in the United Kingdom. She is the creator of the popular blog, The Chirurgeon’s Apprentice, as well as the host of the YouTube series, Under the Knife.